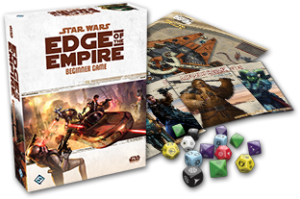 Lately, I’ve been listening to the OneShot campaign podcast: an excellent cast and great GM Kat Murphy play Star Wars Edge of the Empire. I really wanted to play that game but in my gaming group it fall flat because one player has a strong dislike of Star Wars. While I own the Beginner’s Box, the core game and some of the supplements, I only had the chance to play the Beginner’s Box online via G+ Hangouts last year. EotE is a bit more crunchy than I’d normally prefer but the narrative dice roll system is really neat and the game oozes Star Wars out of every pore. So, what to do when you can’t play this game with a group? Right, you do it solo. I forgot most of the rules so I’m gonna herd three of the pregens through the adventure in the Beginner Box to re-familiarize myself with the system. That means I’m going to be the GM and I’ll try to emulate the PCs. I tried EotE solo once but found 4 characters a bit too cumbersome. The adventure in the Beginner Game is aimed at 2-4 players, so I’ll take the middle ground and use 3 pregens. I’m running this with the chrome addon Solo RPG Tools for Google Docs for emulating the players, the game engine behind it is the Mythic GME (aff). This is a detailed write-up of the game, including all mechanics. // block text to read aloud, it basically says that you’re on TATOOINE and want to escape Hutt crime lord TEEMO. There’s a starship in the landing bay of Mos Shuuta’s spaceport: the KRAYT FANG, owned by a Trandoshan slaver called TREX. // The character’s are on the run trying to escape Teemo’s goons as they rush into the local cantina. Again, some boxed text to read out loud. The characters have a chance to hide themselves before the thugs arrive. When you enter the cantina, the Devonarion bartender pauses and stares at you. There are some private booths and a stage against the far wall with a dancing Twi’lek woman. There is a storage closet in one corner and a doorway behind the dancer. Some early patrons are sitting the tables in the middle of the cantina. The arched roof above you is supported by thick, heavy struts. Surprisingly, the dancer seems to have a great heart and agrees. The patrons grumble when they hear Teemo’s name, he is not popular. // use of the advantage to charm other subjects than the target. Some pig-like Gamorreans step through the door. Grunting and whining in their language, they cast a suspicious glance at the cantina but see nothing of interest. Slowly, they turn around. If you like you can ambush them, you are sure they won’t stop trying to find you. // Initiative: first PCs, then NPCs, because the PCs could hide themselves. Oskara bursts out of the backstage, gun(s) blazing. The shot goes wide but surprises the Gamorreans. 41-Vex draws his Light Blaster and fires at the foremost thug. The Gamorrean stumbles back hit with a blaster bolt. He tumbles against his companions and gives Pash an opening for another blaster shot. The 3 other goons are shocked by the attack. Still, they have orders. They charge ahead with their cudgels to engage Oskara in close combat. Oskara backs away and fires the blaster carbine into the snout of one of the pig-like beings. She uses the dead thug as a shield for the next attack. Pash fires into the back of one of the two remaining goons. 41-Vex also takes a shot with his Light Blaster, first aiming. There is only one of the thugs left, but he isn’t intelligent enough to flee. Or maybe he knows he won’t fare better against Teemo. Oskara looks intimidating enough, so he takes a step towards Vex and swings at the unsuspecting droid. Oskara shoves her meatshield into the face of the remaining goon, brings her Blaster Carbine in firing position and fires away. Now the characters need to get off the planet. Luckily the bartender has an idea. The PCs can enter the junk shop which is owned by an old human male. He grumpily kicks a can-shaped R5 and yells at him to go outside and finish the work on the speeder bike. The PCs tell him that they just have need for the HRMI and don’t know anything about the Krayt Fang. But it’s obvious that the old man doesn’t believe them. The PCs leave the shop. Oskara and 41-Vex will create a diversion and Pash will try to steal the HRMI. 41-Vex decides to take the droid out of the equation and can easily disable it. He and Oskara use some of the crap at the junkyard to set up an explosion. Then they go hiding. When Vorn hear the explosion he rushes out of the shop, yelling for the droid. Pash can slip in and pilfer the shelves for the HRMI. He also finds a stimpack. Overall, this was fun but the rules can be fiddly if you're not familiar with them. Still, I really love the dice mechanic. The Beginner Box is a really fine way to introduce gamers to the system as it brings rules into play gradually. I'm looking forward to continuing this game although I prefer playing solo games as player with a GM Emulator as it allows for more surprises. The Beginner's Game is quite railroady. Google Chrome Addon "Solo Roleplay Tools"